Ben J. Wattenberg, host/essayist of The First Measured Century, is a senior fellow at the American Enterprise Institute and writes a weekly newspaper column syndicated by United Media to more than 200 newspapers. 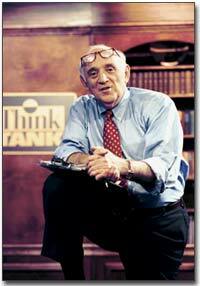 Ben is the host of the weekly PBS series Think Tank with Ben Wattenberg, and is host/essayist of three recent PBS documentaries: The Grandchild Gap, A Third Choice, and Values Matter Most. He is the author of eight books including The Good News Is the Bad News Is Wrong, The Real America, The Birth Dearth, The First Universal Nation, and Values Matter Most. He is a co-author of The Real Majority (with Richard Scammon), This U.S.A., and The First Measured Century: An Illustrated Guide to Trends in America 1900-2000. He began his career in politics as an aide and speechwriter for President Lyndon B. Johnson from 1966-1968, and served as an advisor to Sen. Hubert Humphrey's race for the Senate in 1970 and Sen. Henry Jackson's bids for the Democratic presidential nomination in 1972 and 1976. �He was appointed by President Jimmy Carter to serve on the Presidential Board for Ambassadorial Appointments and as a public member of the American delegation to the Madrid Conference on Human Rights. �In 1981, he was appointed by President Ronald Reagan to the Board of Radio Free Europe and Radio Liberty, a position he held for 10 years, eventually becoming the board's vice president. In 1991, he was appointed by President George Bush to the Task Force on U.S. Government International Broadcasting, and, in 1992, he was appointed by House Speaker Thomas Foley to the Commission on Broadcasting to the People's Republic of China.